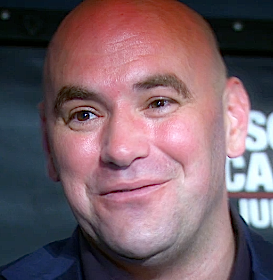 Giving his traditional post-fight media scrum, UFC President Dana White talked to the press following UFC 150 Saturday night in Denver. White announced the event had the worst ticket sales since 2007, and to make matters worse, Direct TV had technical difficulties and went down, meaning no one was able to watch the Pay-Per-View via Direct TV. White said it is the first time that has ever happened. He blamed the low ticket sales on all the troubles that have surrounded the Denver area this year with the recent shooting and fires. White gave his thoughts on the Benson Henderson vs. Nate Diaz match-up and also shared his thoughts on the Jake Shields vs. Ed Herman fight — he was less than impressed. White announced Junior Dos Santos will fight Cain Velasquez Dec.29 on Pay-Per-View. He talked about his recent beef with Jason “Mayhem” Miller and how Roy Nelson remains a thorn in his side. White touched on Jon Jones’ new Nike sponsorship and his upcoming fight with Dan Henderson… All this and much much much more! !